Q: How do I change the device’s theme? 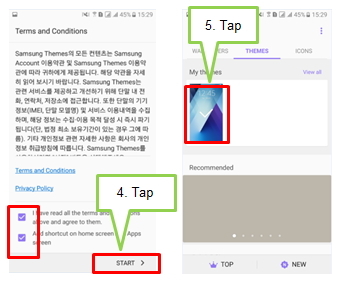 If you want to change the device’s theme, please follow the steps below. 1 You can apply various themes to the device to change the visual elements of the Home screen, locked screen, and icons. On the Home screen, tap and hold an empty area, or pinch your fingers together to access the available options. Note: Visual elements of interface, such as colors, icons, and wallpapers, will change depending on the selected theme. 4 When you visit the Theme Store firstly, Please accept Disclaimer. 5 Choose the theme which want to download from Store. 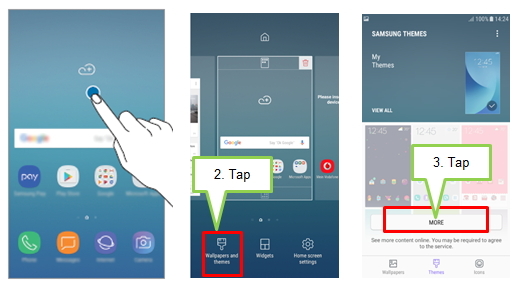 Note: that you need to log in Samsung Account in advance for downloading themes.